Hello friends. This is my latest Videohive project. 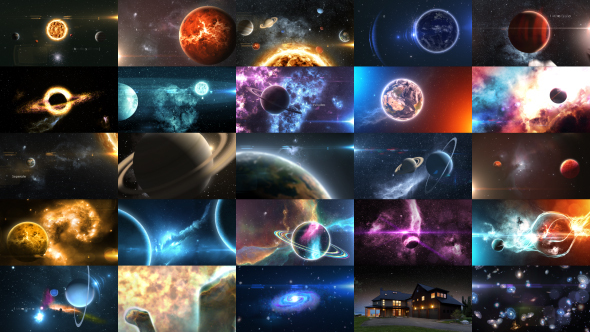 This project is basically a Solar system which is all done inside of After effects. Most of the scenes are not Pre rendered and actually are changeable. You can create your own scene by some work and even change the existing scenes. You can also change the order of the scenes because each scene is created in a different comp. In the demo i have made it a Titles files for you cinematic Title Sequences or Science Fiction projects but there is much more to it. You can see the space galaxy and nebula a little bit and this makes it even more interesting. I hope you just like it. If you have any question regarding the project or have any problems just send me a message or mail me through my marketplace profile. What comes with the Project? 1. This project comes with 52 Pre made scenes. 4. 11 Milky Ways & Galaxies. 6. Red, Blue & Yellow Star Suns. 7. 2 separate Loops of each planet and moon are included with day and night rotation. 8. 1 Separate Comp for each planet has been included for you benefit. 9. You can also make your own unique scene with the help of the those planets. 10. 4 Pre Made Title Sequences are also included.